Following the lead of the most important critic in wine, Robert Parker, who just publicly apologized for his attitude towards Burgundy, F&W Executive Wine Editor Ray Isle does some apologizing too. Following the lead of the most important critic in wine, I figured that I should do some apologizing too. I need to apologize to Pinotage. I am sorry that I have said that wines made from Pinotage smell and taste like old horse blankets. I’ve heard that thousands of South Africans love Pinotage, but as I haven’t been there yet, I’m still skeptical. Nevertheless, my bad. Grapes have feelings, too. Also, I probably ought to apologize to the natural wine movement. When I said, “Natural wine tastes like frickin’ swamp water,” what I really meant was, “Natural wine brilliantly expresses terroir in an unadulterated, non-industrial way.” Whoops! I definitely need to apologize to that guy at that industry tasting back in 2003, the one with the really shiny brown shoes. I didn’t mean to spit into the spit bucket in such a way that Chianti (and spit) splashed on your shoe. I also didn’t mean to think, “Oh, what the hell, he’ll never notice.” And if you did notice, hey—I also apologize for having left that table really quickly. Furthermore, I would like to issue a formal apology to the entire reading public for describing a wine as follows: “Dense and very ripe, it’s somewhere between a black compote and a black hole. If Paul Bunyan had been Spanish, he would have drunk this wine from hogsheads.” I have no excuse. Bring out the cone of shame and make me wear it. I deserve nothing less. Thank god it was ten years ago. 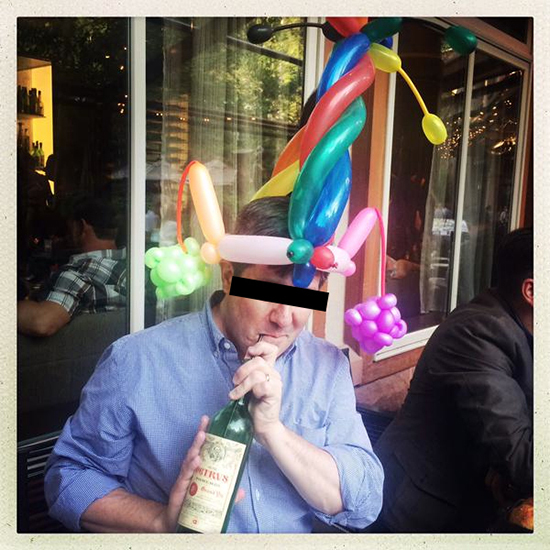 Lastly, I absolutely, positively must apologize to Christian Moueix for taking a picture of myself drinking Château Pètrus while wearing a three-foot-tall, multicolored balloon hat. Pètrus was not founded so that people wearing balloon hats could drink it. I recognize this. And I am deeply mortified. It should have been a bottle of Domaine Romanée-Conti Montrachet. I pray for your forgiveness. Related: What Wine Goes Best With Burgers?